Emma Hogan BA(HONS) Animation, illustrator of the front cover of my book Keeper of the Enchanted Pool is an extremely talented artist. 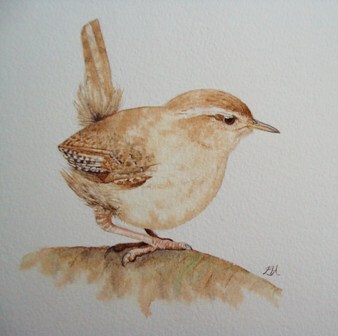 Her remarkable talent for painting lifelike pictures of wildlife was spotted by The Wallington Gallery. Her watercolour paintings of birds are now included amongst their collection of Fine British & European Paintings for sale, including, among many other talented artists, William Hoggatt and Bill Hindmarsh. The Wallington Gallery is based in Corbridge, Northumberland and run by run by Brian Alger with involvement from the well-known and respected Mrs. Gillian Fairless. Emma’s eye for detail is remarkable. It has been said that her paintings look like photographs. With an ability to draw and paint in any medium and any subject, I am sure that Emma will be a name to watch out for in the Art world. Her paintings are available from The Wallington Gallery framed and with free postage and packing Worldwide for all paintings bought on line. Lovely paintings of my favourite things! Thank you, Sue. I’m very proud of Emma’s art.